Ian Woodward's Investing Blog » Bounce Play or Dead Cat Bounce? « Bounce Play or Plunge into the Abyss? 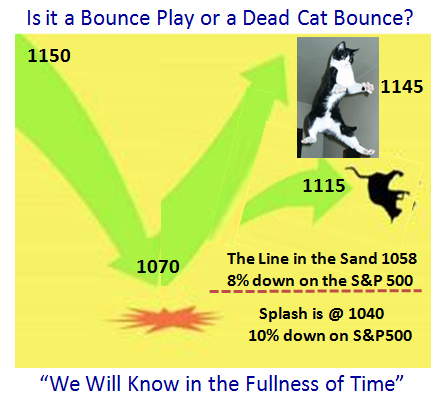 Bounce Play or Dead Cat Bounce? The next chart needs no explanation, but as you can see there is tremendous symmetry in the relationship between the VIX and the S&P 500, so it seems to me that it is an easy call to make on the demarcation of where the Bulls and Bears are winning the tug-o-war. We are sitting at around 1103 at the moment and with any luck another 12 points are on the cards to get to that stubborn line @1115. I suspect that given the general mood and bias to the downside that a Dead-Cat Bounce will peter out at 1115 and produces no Cigar! The Bears are itching to short, but waiting patiently for the first sign of weakness after this two day rally. 1. Drive the short-term rally as far as they can towards 1145, and anything short of close to that will be the signal for the Bears to have at it. 2. On the downside they must hold 1070…the recent low, or we will see the famous 8% down where 77% of all S&P 500 corrections turn back, or we head on down to 1040 which is 10% down. After that it is anyone’s guess. 1. Hold the fort at above 18 on the VIX and I would be surprised if it will get much below 20 even with a move to S&P 500 of 1115. 2. 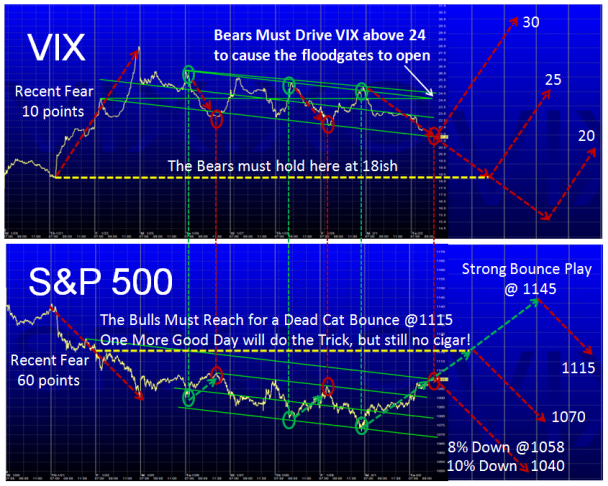 Drive with “Bear fear” of 5 or more points per day on the VIX and break above 24ish for the real floodgates to open. That could take the VIX to 30 which is where most recent moves are turned back unless the floodgates turn into a deluge. So now you have the simple game plan for the foreseeable future. The March Seminar is now less than eight weeks away and it is time you signed up to get a seat. We will be back at the Library, so as usual we can take 55 people with first come first served. This entry was posted on Tuesday, February 2nd, 2010 at 4:26 pm	and is filed under HGS Principles, Market Analysis. You can follow any responses to this entry through the RSS 2.0 feed. Both comments and pings are currently closed.